Prescribed burning is an important management tool in jarrah (Eucalyptus marginata Sm.) forests of southwest Western Australia to reduce the risk of damaging bushfires. In 1986 to 1987, we established long-term study sites in dry (mean annual rainfall ~700 mm) and moist (mean annual rainfall ~1000 mm) jarrah forests to assess the effects of prescribed burning, as well as other fire treatments including fire exclusion, on the composition, richness, and relative abundance of forest understory vegetation. Over almost 30 years, species assemblages within all fire treatments changed significantly through time, but the changes were independent of treatment. The pattern of change in composition of fire response types over elapsed time was different between sites. At the dry site, changes in species assemblages were initially relatively large in the first decade or so of the study, but slowed thereafter. At the moist site, compositional change driven by obligate seeding shrubs occurred faster and more uniformly with time across all treatments. Species richness was also independent of fire treatment at both sites. Species richness decreased with elapsed time on the moist site but increased with elapsed time on the dry site. The stronger elapsed-time effect rendered the time since fire effect on loss of species richness on the moist site to be insignificant, but there was an inverse relationship with time since fire at the dry site. Within each site, there were clear patterns of changing abundance based on life form and fire response groups, but this was not consistent between sites. At the scale of the current study, jarrah forest plant communities displayed resilience to imposed experimental fire regimes. 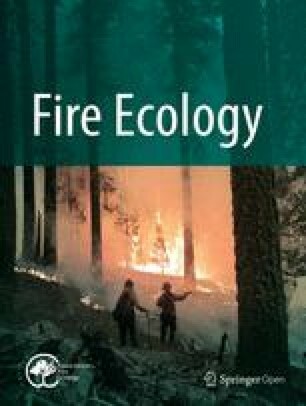 Over time, either elapsed time or time since fire, species assemblages across all treatments changed regardless of fire treatment, but changes were mostly associated with specific plant life forms and fire response traits, suggesting that the process is both deterministic and stochastic. While many species changed in abundance over time, no species were lost as a result of the fire treatments. Within the fire frequency and intensity ranges investigated in this study, there was flexibility in the application of prescribed fire to achieve management objectives without loss of plant diversity. The online version of this article ( https://doi.org/10.1186/s42408-019-0025-0) contains supplementary material, which is available to authorized users. Las quemas prescriptas son una herramienta de manejo importante en los bosques de “caoba del Rio Swam” o jarrah (Eucalyptus marginata Sm.) en el sudoeste del territorio del Oeste de Australia, para reducir el riesgo de incendios perjudiciales en arbustales. En 1986 y 1987, establecimos sitios de estudio de largo plazo en bosques secos (precipitación anual ~700 mm) y húmedos (precipitación anual ~1000 mm) de jarrah, para determinar los efectos de quemas prescriptas, como así también de otros tratamientos incluyendo la exclusión del fuego, sobre la composición y riqueza, y la abundancia relativa de la vegetación del sotobosque. Por casi 30 años, el ensamble de especies dentro de todos los tratamientos cambió significativamente en el tiempo, aunque los cambios fueron independientes de los tratamientos. El patrón de cambio en los tipos de respuesta al fuego en el lapso de tiempo desde el inicio de los tratamientos fue diferente entre los sitios. En el sitio seco, los cambios en el ensamble de especies fueron inicialmente relativamente grandes en la primera década del estudio, pero disminuyeron con el tiempo. En el sitio húmedo, el cambio en la composición, regulado por los arbustos que se reproducen estrictamente por semillas, ocurrió más rápido y más uniformemente en el tiempo en todos los tratamientos. La riqueza de especies fue también independiente de los tratamientos en ambos sitios. La riqueza de especies disminuyó con el tiempo en el sitio húmedo pero aumentó en el sitio seco. El fuerte efecto del tiempo desde el inicio de los tratamientos adjudicado al fuego en la pérdida de riqueza de especies en el sitio húmedo fue insignificante, aunque tuvo una relación inversa desde el inicio de las quemas en el sitio seco. Dentro de cada sitio, hubo claros patrones de cambio en abundancia basados en las formas de vida y en la respuesta de los grupos, aunque éstos no fueron consistentes entre ambos sitios. A la escala del corriente estudio, las comunidades de bosques de jarrah demostraron su resiliencia a los regímenes de fuego experimentales expuestos. Con el tiempo, y desde inicio de los tratamientos o desde el tiempo en que algunos fueron quemados, todos los tratamientos cambiaron independientemente del tratamiento de fuego aplicado, aunque estos cambios fueron mayoritariamente asociados a tipos de vida específicos y a la respuesta a las características del fuego, sugiriendo que este proceso es tanto determinístico como estocástico. Aunque muchas especies cambian en abundancia en el tiempo, ninguna especie se perdió a consecuencia de los tratamientos de fuego. Dentro de los rangos de frecuencia e intensidad investigados en este estudio, existe flexibilidad en la aplicación de quemas prescriptas para lograr objetivos de manejo sin pérdidas en la diversidad vegetal. Fire is a natural environmental factor that has shaped the floristic composition and structure of southwest Australian jarrah (Eucalyptus marginata Sm.) forests over many millennia (Dodson and Lu 2000; Hassell and Dodson 2003). Consequently, the plants display a great diversity of fire adaptations that enables them to persist with fire and, in many cases, the plants are dependent upon fire for their regeneration (Christensen and Kimber 1975; Christensen and Abbott 1989; Burrows and Wardell-Johnson 2003). While plants are adapted to fire, they are unlikely to be adapted to all fire regimes (Gill 1975, 1981). Today, prescribed fire is used by land managers to achieve a range of objectives, including the protection of human communities, biodiversity, and the environment from damaging bushfires, and maintenance of ecosystem health (Burrows and McCaw 2013). However, the practice is controversial; some authors suggest that prescribed burning may have negative biodiversity outcomes (Carey and Morrison 1995; Morrison et al. 1995; Driscoll et al. 2010; Bradshaw et al. 2011). There is no evidence that, after almost 60 years since implementation, the practice of prescribed burning has caused loss of species or irreversible decline in ecosystem health in southwest Australian forests (Wittkuhn et al. 2011). However, there are few published long-term longitudinal studies, which are necessary to properly evaluate the effects of prescribed burning. Most long-term fire studies have been undertaken in grasslands, such as African savannas or North American prairies. 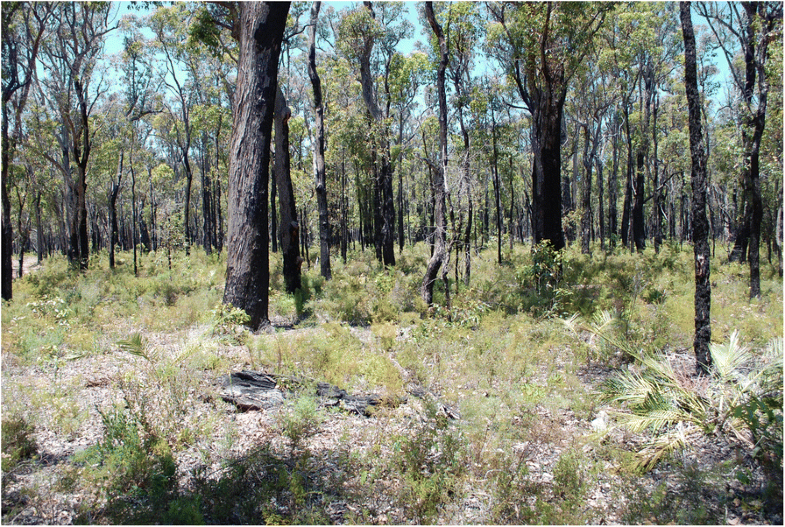 Notable Australian long-term fire ecology studies include those implemented in the tropical savannas in the Northern Territory from the 1970s to the 1990s (Bowman et al. 1988; Andersen et al. 1998). Long-term forest fire ecology studies were established in subtropical southeast Queensland in Bauple and Peachester state forests in 1952 and 1971, respectively (Lewis and Debuse 2012; Lewis et al. 2012). Bauple State Forest is composed of a mixed eucalypt species overstory and a grassy understory with scattered woody shrubs, so in the Lewis et al. 2012 study, the “frequent fire” treatment plots were burned annually (since 1952) and the “infrequent fire” treatment plots burned every four years (since 1974). Annual burning reduced the density and richness of taller understory plants, but the treatments had no effect on species richness and density of shorter understory species (Lewis and Debuse 2012). At the Peachester State Forest site, three fire frequency treatments were applied: long unburned, biennial burning, and quadrennial burning. As expected, there were no tall resprouter plants in the frequently burned plots, which had the highest density of low resprouters. There was no observed difference in the richness or density of obligate seeders across treatments, but grass was at a higher density in the frequently burned plots (Lewis et al. 2012). There are a few reported long-term longitudinal fire studies in southern Australian temperate forests. One study was conducted in high rainfall mixed marri-jarrah forest in southwest Australia from 1970 to 2001 (Burrows and Wardell-Johnson 2003), but from which little was published. Another was in mixed eucalypt foothills forest in Victoria, established in 1984, which is still active (Tolhurst and Oswin 1992). Both studies applied similar fire treatments including frequent fires (3 to 4 yr) in spring and autumn, infrequent fires (7 to 10 yr) in spring and autumn, and fire exclusion. With regard to understory species responses, key conclusions from these studies were that, while there were changes in abundance across the treatments, no species had been lost as a result of fire treatments, and there were no irreversible differences between spring and autumn fires (Burrows and Wardell-Johnson 2003; Tolhurst 2003). Penman et al. (2008), working in dry eucalypt forest in southeast Australia, reported that, after initially increasing, plant species richness declined with time after wildfire, but noted that this may have been related to sampling scale and changes in species abundance. Appropriate sampling scales are necessary to accommodate the variability in changing abundances, especially when species are low in abundance. In the absence of long-term field data, some scientists have modelled outcomes of various fire regimes on the persistence of plant populations, based on vital attributes and life histories (Bradstock et al. 1997; Bradstock et al. 1998; Enright et al. 1998; Groeneveld et al. 2008; Nield et al. 2009). While modelling can provide valuable insights, the models necessarily make assumptions about fire behavior and plant responses (Ooi et al. 2006; Burrows and Middleton 2016). Most ecological studies that purport to be long-term usually substitute spatial for temporal replication (Morrison et al. 1995; Wittkuhn et al. 2011; Gosper et al. 2012a; Knuckey et al. 2016). This approach can be useful, but the results must be interpreted with caution as it assumes that, prior to applying treatments, the study sites were the same and that differences between treatments are due to treatment effects only. If this assumption is incorrect, then erroneous conclusions may be drawn about cause and effect (Gill 1977; Hargrove and Pickering 1992). The dearth of well-designed long-term studies is largely due to inadequate planning, changing priorities, and lack of ongoing funding and support (Lindenmayer and Likens 2009), and for many scientists, there is a lack of incentive to participate in long-term studies. The challenge of maintaining long-term longitudinal studies is accentuated when they require the regular implementation of often expensive and potentially dangerous treatments such as fire. Different fire treatments (frequency or season of fire) do not lead to permanent differences in plant species richness in the plots. Fire treatment (frequency or season of fire) has no effect on similarity in plot composition of plant fire response types. Fire treatment (frequency or season) has no effect on similarity between plant assemblages on plots. We tested these hypotheses using analysis of covariance (ANCOVA; Rutherford 2013) and permutational multivariate analysis of variance (PerMANOVA; Anderson 2014) and made assumptions that were explored via the effects of two covariates in analyses. The covariate “years since fire” potentially has effects on species richness, composition of fire response types, or species composition of assemblages that are independent of fire treatment because different species with different ecological traits have different life histories following fire (Keith et al. 2007; Keith 2012). In examining the effect of this covariate, we tested whether the trajectories of dependent variables were the same in compared treatments for which time elapsed since fire in the treatments was congruent. The covariate “years elapsed” potentially has effects independent of fire treatment because of: a) stochastic drift (Velland 2010; Rosindell et al. 2012), and b) species at the two sampled locations were exposed to selection by the same regional trends in temperature and rainfall over the measurement period (Makuei et al. 2013), with differential effects on species (Enright et al. 2014). Species may also be affected by differential interactions between fire, grazing, and other perturbations (Kirkpatrick et al. 2016; Rathbone and Barrett 2017), but this study was not designed to examine these interactions. 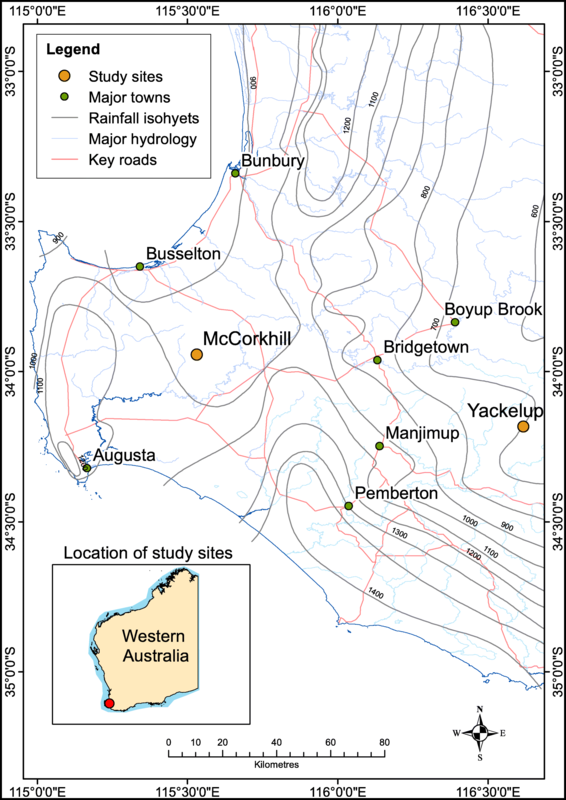 In 1986 to 1987, two experimental sites were established in southwest Australian jarrah forests that represent high rainfall (McCorkhill forest; mean annual rainfall ~1000 mm) and low rainfall (Yackelup forest; mean annual rainfall ~700 mm) forests (Fig. 1). The McCorkhill site (33.9438° S; 115.5312° E) is in the main forest belt, some 20 km from extensively cleared farmland. The site is characterized by an overstory of jarrah and marri (Corymbia calophylla [Lindl.] K.D.Hill & L.A.S.Johnson) to 30 m with a canopy cover of 45 to 55%, and a midstory of smaller tree species such as Allocasuarina fraseriana (Miq.) L.A.S.Johnson, to 10 m. The understory vegetation is composed of a rich diversity of herbs and shrubs up to 2 m high, but mostly <1 m, with a ground cover of 55 to 70% (Fig. 2). The Yackelup site (34.1834° S; 116.6186° E), some 104 km east of the McCorkhill site, is on the eastern edge of the main forest belt and some 2.5 km from the western edge of extensively cleared agricultural land (the “wheatbelt”). The overstory is composed of jarrah and marri to 20 m high with a canopy cover of 30 to 40%, a midstory to 6 m similar to but sparser than the McCorkhill site, and a low (mostly <0.5 m high), open (30 to 40% cover) understory of herbs and shrubs (Fig. 3). Both locations experience a mediterranean-type climate with cool, wet winters and warm, dry summers. The McCorkhill site has a pre-study history of light selection logging since the 1950s and a history of prescribed burning at 6- to 8-year intervals since the mid 1970s, with the occasional wildfire, the last being in 1968. The Yackelup site was lightly logged during the 1960s and 1970s and, since the 1960s, has experienced low intensity prescribed burns in autumn and spring at 8- to 14-year intervals. There have been no recorded wildfires at this site since the late 1950s. At each location (site), twelve 4 ha (200 m × 200 m) plots were constructed (including two plots that were not used in this study), with each plot separated by a 3 m wide fuel break. Within each plot, ten 5 m × 2 m permanent quadrats were established (20 per treatment) to assess understory vegetation responses. The Yackelup site was only 2.5 km from cleared farmland, so a fence was installed around each 10 m2 sample quadrat immediately after the initial fire to prevent anticipated post-fire grazing by known concentrations of native marsupial herbivores (Burrows and Christensen 2002). Based on field observations, grazing was negligible at the high rainfall McCorkhill site, which was some 20 km from cleared farmland, so sample quadrats were not fenced. We derived a regional annual rainfall anomaly for McCorkhill by averaging the annual anomaly for the closest official Bureau of Meteorology (BoM) rainfall stations, which were at Margaret River (40 km west; 33.96° S 115.06° E), Jarrahwood (19 km northeast; 33.80° S 115.67° E) and Nannup (24 km south-southeast; 33.98° S 115.77° E). Similarly, a regional anomaly was calculated for Yackelup based on nearest BoM stations at Westbourne (10 km north; 34.09° S 116.66° E), Frankland (43 km southeast; 34.44° S 116.99° E), Newbicup (25 km northwest; 34.00° S 116.43° E) and Boyup Brook (40 km northwest; 33.83° S 116.39° E) (Bureau of Meteorology 2018). Anomaly for each station was based on their average and standard deviation of rainfall for the period 1975 to 2017. We derived the following covariates: annual rainfall anomaly for the calendar year for which winter was immediately prior to the time of last fire before measurement; annual rainfall anomaly for the calendar year of the first winter after the last fire before measurement; years since fire; average anomaly for the 10 years prior to measurement; annual rainfall anomaly for the calendar year of the winter prior to measurement; and years elapsed. We tested for correlation between the covariates. The long-term effects of five fire treatments on understory vegetation were investigated at each site, including fire exclusion and other fire regimes that could be applied to these forests to achieve management objectives. Fire treatments were allocated to plots in a randomized block design at each site, with some adjustment to accommodate efficiency and safety in setting the fires. Fire treatments are summarized in Additional file 1 and range from long unburned (34 to 39 yr) to very frequently burned (mean interval 4.8 to 4.3 yr). Weather and operational factors, such as the availability of resources to safely implement the burns, influenced when and how often burn treatments could be applied. The difference in fire interval between the two sites for each treatment reflects the variation in the rate of fuel accumulation and minimum intervals at which these forests can burn under conditions of moderate forest fire danger rating (Burrows 1995). Fire behavior information (rate of spread, flame height, and fire intensity) was recorded and, in most cases, fuel moisture content and weather conditions during the fires was also recorded. The experimental fires were low to moderate intensity (mostly <500 kWm−1; flame heights mostly <1.5 m), with intensity varying with fuel age and season of burn. Timing of sampling in relation to time since fire varied between treatments and, for logistical reasons, all treatments were not necessarily assessed at the same time (see Additional file 1). At each assessment, all understory species within each 10 m2 quadrat were recorded and voucher specimens collected and lodged with the Western Australian (Perth) Herbarium. A final assessment was conducted at both sites in 2015. While it was preferable to undertake assessments in spring during the peak flowering period, this was not always possible. Each species was allocated to one of five life form or habit categories (after Paczkowska and Chapman 2000): shrub; perennial herb (including sedges); annual herb; geophyte; or “other” (several annual grasses, a cycad, two species of Xanthorrhoea Sm., and Kingia australis R.Br.). Each species was also allocated to one of seven post-fire response categories, which broadly followed Gill (1981). While there was likely some intra-specific variability in post-fire regeneration response, we categorized species according to the predominant response based on field observations. 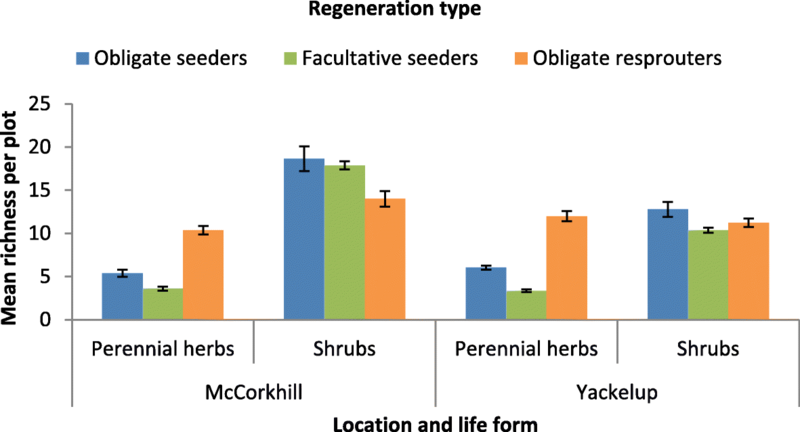 For analysis, we condensed Gill’s categories into three fire responses categories (after Pausas and Keeley 2014): obligate seeders; obligate resprouters; or facultative seeders—species observed to both resprout and consistently regenerate from seed over the range of fire intensities experienced during this experiment. We analyzed species presence-absence data to avoid problems commonly associated with measures of abundance (e.g., Anderson et al. 2012), such as difficulties with quantifying the abundance of clonal species, and the influence of time since fire on stocking densities. Because of detectability and identification issues resulting from the variable timing of sample events, annual herbs and geophytes were excluded from analysis, as was the small group of “other” life forms. 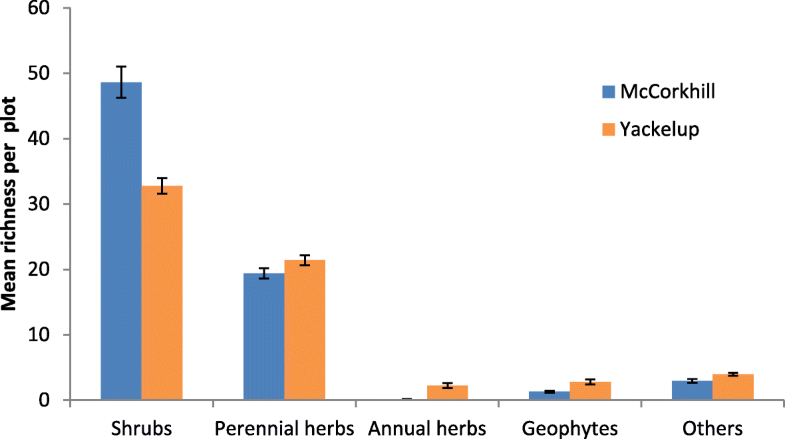 All perennial herb and shrub data collected were analyzed. Two types of analysis were performed. We examined treatment effects on species richness by analysis of covariance (ANCOVA; Rutherford 2013) on species richness per plot. We used permutational multivariate analysis of variance (PerMANOVA; Anderson and Walsh 2013) to investigate treatment effects on assemblage compositions. PerMANOVAs were conducted on Euclidean distance between plots in the proportion of fire response types in perennial herbs and shrubs (e.g., Anderson et al. 2005), and on Sørensen dissimilarity between plots in assemblages of perennial herbs and shrubs. Similar designs were subjected to each of the analyses as detailed in Table 1. Treatments were allocated in a randomized block design, with each site (McCorkhill or Yackelup) analyzed separately. At each site, there were five fire treatments (Additional file 1) × 2 plots × a variable number of sampling events per treatment (Additional file 1). In each case, covariates were years since last fire, years elapsed (since November 1987 for McCorkhill, and since December 1986 for Yackelup), and (years elapsed)2 only for ANCOVA of Yackelup species richness per plot. Exploratory analysis revealed species richness followed a curvilinear response to elapsed time at Yackelup but not McCorkhill. The covariates were not independent to the extent that elapsed time and time since fire were perfectly correlated for the very infrequent fire treatment but essentially uncorrelated for all other treatments (Table 2). Plots were nested within fire treatment. The effect of sampling event, which incorporated effects of variation in species detectability and variation between survey teams, was tested in the PerMANOVAs and was also nested within fire treatment. Type I sums of squares were used in PerMANOVAs, and the covariate time since fire considered before the effect of the elapsed time covariate, with permutation of raw data under a reduced model with 9999 permutations allowed. A total of 329 plant species were recorded at both sites: 246 at McCorkhill, 239 at Yackelup, and 156 species were common to both sites. Across both sites, the number of species recorded in a 10 m2 quadrat ranged from 9 to 41 with a mean of 22.3. Shrubs were the dominant life form followed by perennial herbs; together, these groups made up 78% of species at Yackelup and 82% of species at McCorkhill (Fig. 4). About 25% of shrubs were obligate resprouters, the remainder were either obligate seeders or facultative seeders. This contrasts with the perennial herbs group in which about 60% were obligate resprouters (Fig. 5). Fire treatment had no significant effect on species richness at McCorkhill or Yackelup after removing the effects of years elapsed and years since fire (Table 3). Plot species richness decreased at McCorkhill with years elapsed (Fig. 6). However, years since fire effects were rendered insignificant at McCorkhill when the years elapsed effect was accounted for. At Yackelup, plot species richness increased with years elapsed (Fig. 6a) and decreased with years since fire (Fig. 6b). 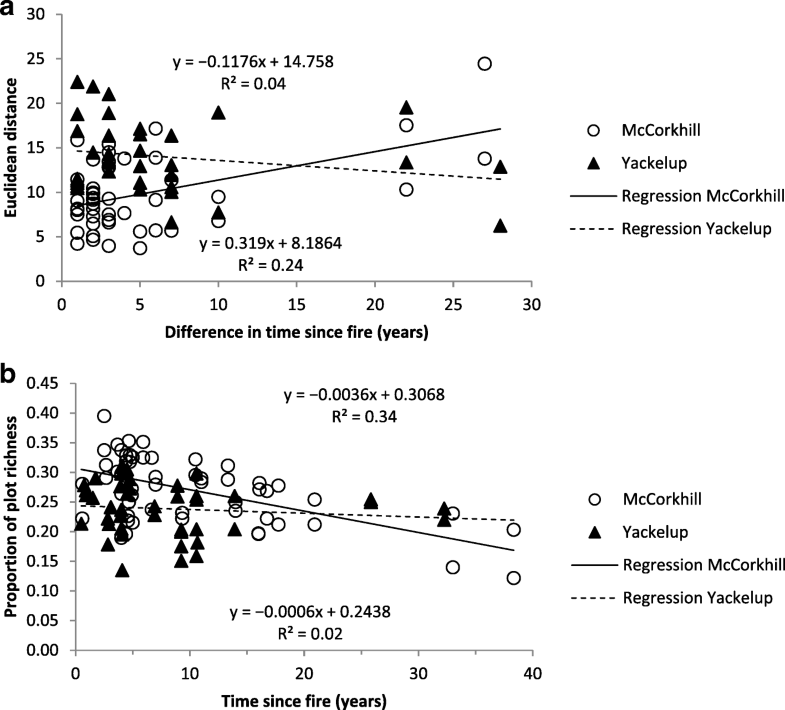 Years since fire was a contributor to differences in fire response type composition on McCorkhill but not Yackelup (Table 4). Euclidean distance between response type compositions on plots on McCorkhill increased as the difference in years since fire increased (Fig. 7a), due largely to the decrease in proportion of shrub obligate seeders (Fig. 7b). Years elapsed contributed to differences in composition on both McCorkhill and Yackelup (Table 4). Euclidean distance between response type compositions on plots increased as the difference in years increased (Fig. 8a), driven by changes in fire response types such as proportional composition of herb obligate resprouters with elapsed time (Fig. 8b). Treatment effects on fire response type composition were significant at Yackelup when the effects of the time covariates were removed. In one of 20 comparisons between treatments made for McCorkhill and Yackelup, only Yackelup very infrequent and frequent spring treatments had different compositions resulting from the effect of fire treatment (t = 1.5773, Pperm = 0.043, unique permutations = 9331). Plot and sample event effects were significant random effects. 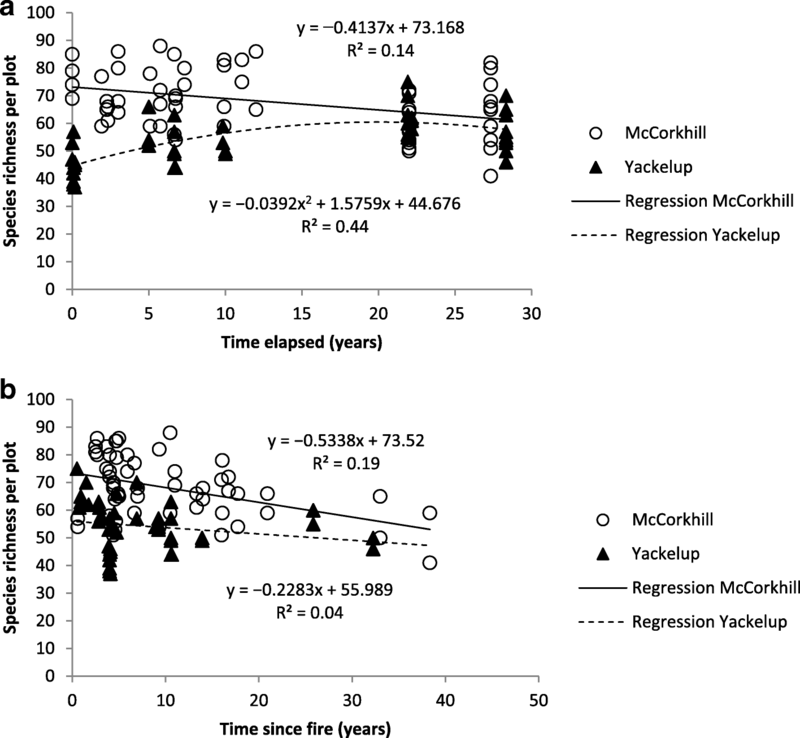 In PerMANOVAs of Sørensen dissimilarity between assemblages, the covariate years since fire had no effect on either McCorkhill or Yackelup (Table 5). The covariate years elapsed had an effect on dissimilarity between assemblages of perennial shrubs and herbs on both McCorkhill and Yackelup (Table 5). 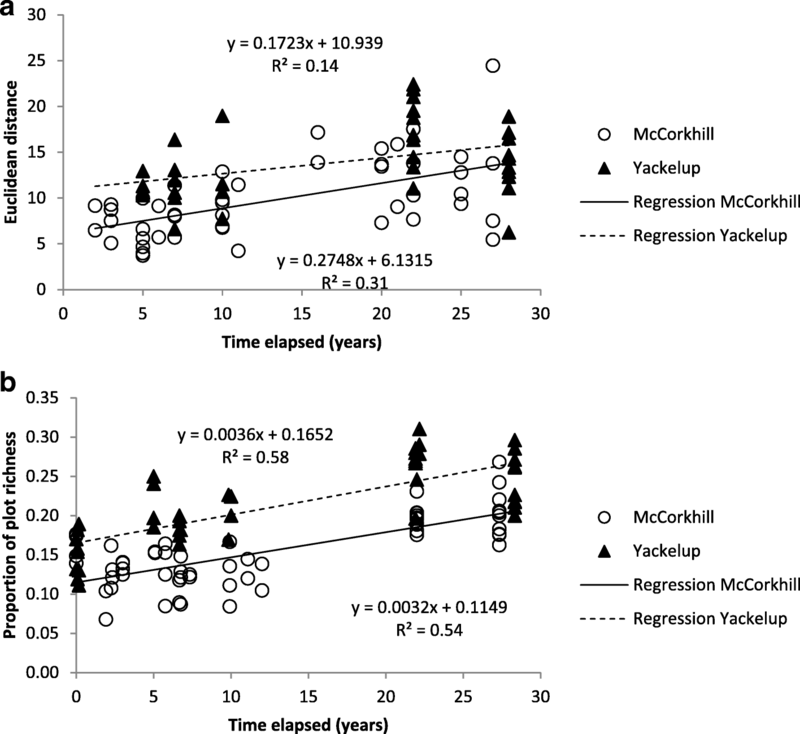 Sørensen dissimilarity between plots increased with years elapsed on both McCorkhill and Yackelup (Fig. 9). Treatment effects were not significant, while plot and sample event effects were significant random effects on both sites (Table 5). Inconsistency between the sites in correlation between rainfall anomaly covariates and years since fire and years elapsed precluded the application of the same set of rainfall anomaly covariates to PerMANOVA analytical designs for both sites. Long-term trends in rainfall were negatively correlated with time elapsed (Table 6), so the hypotheses concerning rainfall could not be tested. This long-term study informs future use of fire for managing fuels in jarrah forests, with particular application to longer-term impacts of repeated burning or fire exclusion on understory plant biodiversity. We examined the effects of fire over an extended time period, necessitating the isolation of time since fire effects and elapsed time effects from the effects of iterative application of prescribed fire and the season of application. Evolution (speciation) and niche ecology are important factors explaining patterns of species distribution and composition (Hutchinson 1959; Woodward 1987; Kreft and Jetz 2007). At the regional scale, climate, landform, soils, and fire largely determine the contemporary structure and composition of the vegetation of the southwest Western Australian forests (Havel 2000; Burrows and Wardell-Johnson 2003). Many studies in fire-prone, fire-maintained ecosystems globally, including the southwest Australian forest region, have demonstrated seral changes in species richness, composition, and abundance with time since fire (Gill 1975; Bell and Koch 1980; Whelan 1995; Carey and Morrison 1995; Bond and van Wilgen 1996; Keeley 2000; Burrows and Wardell-Johnson 2003; Palmquist et al. 2014). In a metanalysis of 244 studies, Eales et al. (2018) found a significant positive effect of prescribed fire on vascular plant richness, which was modified by time since fire. Others have characterized the post-fire response of vegetation according to various succession models (Capitanio and Carcaillet 2008; Pulseford et al. 2016) and functional traits have been proposed as predictors of species and community responses to fire (Noble and Slatyer 1980; McGill et al. 2006; Keith 2012; Mouillot et al. 2013). Based on functional traits and life histories, others have predicted localized or regional plant species extinctions if the fire return interval is shorter than the maturation period of so-called “fire sensitive” species (Bradstock and O’Connell 1988; Gill and Bradstock 1995; Burrows and Wardell-Johnson 2003). In a study similar to the current study, Thuiller et al. (2007), working in South African fynbos vegetation, reported a high temporal turnover of species at the local scale and attributed this to stochastic variability of fire regime. Kelly et al. (2017), working in temperate forests in southeast Australia, showed that the distribution of a number of taxonomic groups was influenced by interactions between fire regimes and environmental gradients. They concluded that, of the fire regime variables, interfire interval had the strongest influence on the distribution of plants. A priori, we expected fire treatment, including fire exclusion, to be a strong driver of changes in plant species assemblages over the almost 30 years between the first and final assessments of the current study. Unsurprisingly, there were within-site and between-site differences in species assemblages due to climatic and edaphic factors. However, we were surprised to find that there were also significant temporal changes in plant species assemblages at both study sites and that the effects of both fire treatment and time since fire on assemblages were statistically insignificant; species assemblages “drifted” regardless of fire treatment and expectations of change due to time since fire. A specific group of fire response plants, the obligate seeders, were largely responsible for the compositional change, even though there was a high proportion of obligate resprouters in the communities studied. The rate of turnover, or “drift” over elapsed time, was different between sites, with an initially large change occurring in the early stage of the study at Yackelup, followed by slow change, while at McCorkhill, it was a slightly faster and more uniform process overall (Figs. 8a and 9). In the absence of a dedicated experimental design, it was not possible to isolate any of the possible mechanisms of drift over elapsed time as outlined in the introduction. In particular, trends in rainfall anomaly were negatively correlated with time elapsed. Thus, their role on the drift of assemblages at both Yackelup and McCorkill is uncertain. While there was probably a low level of post-fire grazing at the McCorkhill site, which was unfenced, it was not visually apparent. There is substantial global literature on fire and grazing interactions for grassland and savannah ecosystems, and some literature on grazing by introduced animals in a variety of Australian ecosystems (Archibald et al. 2005; Briggs et al. 2005; Kutt and Woinarski 2007; Keith and Tozer 2012), but there is a dearth of literature on interactions between fire and grazing by native fauna in temperate sclerophyll vegetation, including eucalypt forests. In general, these studies report that post-fire grazing can significantly affect the regeneration, survival, and growth of many species in native plant communities, depending on the scale of the fire and the level of grazing pressure (Leigh and Holgate 1979; Hill and French 2004; Foster et al. 2015). Also, the temporal changes in fire response type composition reported here were found to be of similar magnitude on both sites with respect to elapsed time, and differ between sites with respect to time since fire, suggesting local processes (such as grazing, the available pool of seeder species, edaphic conditions, and moisture availability) dominated regional-scale processes (such as climate trends). As an alternative to niche ecology, Hubbell (2001, 2005) proposed the unified neutral theory (UNT), which suggests that community assemblages, aside from speciation and random dispersal, are a consequence of stochastic processes (ecological drift). Underpinning UNT is the assumption that trophically similar species within a community are identical in terms of their vital attributes, recruitment, and dispersal capabilities (functionally equivalent), so the composition of assemblages drifts randomly with time (Hubbell 2001). Others suggest that selection, drift, speciation, and dispersal interact to drive changes in species assemblages (Velland 2010); or that UNT, as part of a “unified theory,” could complement or link with speciation and ecologic niche theory in explaining patterns of species assemblages (Chave 2004; Rosindell et al. 2011). In addition to being at odds with niche ecology theory, UNT appears to be at odds with the concept of alternative stable states, or transient states, which suggests that once a community has reached a stable or transient state, it cannot transition to another state unless it is “disturbed” (Gilpen and Case 1976; Lawton 1999; Suding and Hobbs 2009). In reality, communities in fire-prone environments are in a transient state rather than an alternative stable state (Pickett et al. 1989) and, as our results show for the fire-prone plant communities at both sites, the temporal transition to another state (of species assemblage) occurs with or without perturbation by fire. The plant communities studied here violated the functional equivalence assumptions underpinning UNT, with the cohabitation of diverse life forms and post-fire responses. Different fire-response types had different temporal responses following fire, with the proportion of obligate seeders decreasing with increasing time since fire, and Euclidean distance between samples for response-type composition increasing with increasing time since fire at McCorkhill. On the other hand, changes in response-type composition with increasing time since fire were not discernible at Yackelup. At the scale of the sample plots, changes in composition over time result from differences in the “emigration” from and “immigration” to quadrats between fire response types and individual species. This is not surprising as it is well established that seeder species are generally shorter lived but grow more rapidly than resprouters (Lamont and Downes 1979; Bradstock and O’Connell 1988; Enright and Lamont 1989), Le Maitre and Midgely 1992), commit greater resources to seed production and recruitment (more seeds, larger seeds, larger seed banks; Pate et al. 1990, Hansen et al. 1991, Verdu 2000, Bell 2001, Bond and Midgely 2001, Lamont and Wiens 2003), have a much higher pre-dispersal reproductive success (Meney et al. 1997), have greater environmental seed storage and longevity (e.g., Keeley 1998; Pausas and Keeley 2014), and have greater seed dispersal capacity and greater seedling survival rates than resprouters (Pate et al. 1990; Higgins et al. 2008). Rainfall conditions and herbivory are likely to modify the effectiveness of these strategies for recruitment to a site, perhaps accounting for differences in response-type post-fire trends, and commonality in time elapsed trends between the two sites. While fire promotes seedling regeneration, there was no discernible effect of fire treatment on long-term temporal changes in species assemblage, probably because of stochastic and episodic events of mortality, recruitment, and dispersal across all treatments, leading to changes in species composition. Species richness at both McCorkhill and Yackelup sites was highest in the first few years after fire, then declined. However, this trend was also accounted for by the elapsed time covariate to the exclusion of the time since fire covariate on McCorkhill because of the positive correlation between their effects on McCorkhill. Species richness increased with years elapsed and decreased with years since fire at Yackelup. This post-fire species richness trend to decrease is common for many mediterranean-type climate fire-prone ecosystems, including jarrah forests (Keeley 1986; Whelan 1995; Bond and van Wilgen 1996; Gill et al. 1999; Burrows and Wardell-Johnson 2003). At both study sites, all species that were ever going to be on site were present within the first few years after fire. Species richness declines post-fire as plants die either because of their naturally short life cycles or they are out-competed, with limited opportunities for successful inter-fire period recruitment (Christensen and Kimber 1975; Bell and Koch 1980; Abbott et al. 1984; Whelan 1995; Burrows and Wardell-Johnson 2003; Keith et al. 2007; Gosper et al. 2012b). Various models have been proposed to explain this post-disturbance phenomenon of decline in species richness, including various trait-based succession models (Egler 1954, Keith and Bradstock 1994, Grace and Keeley 2006, Capitanio and Carcaillet 2008). In the present study, it was mostly obligate seeder perennial herbs and shrubs that declined over time after fire with the longer-lived facultative seeder-resprouters and obligate resprouters persisting. At the Yackelup site, ANCOVA distinguished differing trends in species richness with time since fire (weak decreasing trend) and elapsed time (increasing richness with time), unlike McCorkhill where ANCOVA could not distinguish an effect of time since fire in the presence of an elapsed time effect (decreasing trend). Inconsistent or obscured patterns in post-fire temporal response in species richness, diversity, and composition have been reported for other plant communities including some California, USA, shrublands (Keeley et al. 2005) and mallee communities in semi-arid Australia (Gosper et al. 2012b); reasons given for this are varied, including fire severity, spatial variability in resources availability, rainfall, and the fire response composition of the vegetation. We can only speculate as to why the study sites reported here responded differently. McCorkhill experiences higher rainfall than Yackelup, so is more productive as reflected in the vegetation being taller and denser (greater cover), and the composition of the vegetation by life form and fire response categories is similar. It is also possible that excluding grazing enabled greater success of inter-fire period recruitment of obligate seeders at Yackelup, since the proportion of this fire response type remained relatively constant with varying years since fire on that site. It has been widely reported in the literature that changes in the abundance of a species is a common post-fire response and depends on the species’ life history and vital attributes in relation to fire regime, site characteristics (including climate and edaphic factors), interactions with other disturbances, and competition between species. Absence of treatment effect on both species richness and assemblages indicates that there are unlikely to be permanent losses in species assemblages resulting from the particular fire treatments in this study. Generally, there is no single fire regime that benefits all species in terms of their abundance. For example, while annual herbs and grasses are usually favored by frequent burning, some obligate-seeder woody shrub species can be disadvantaged, while other species are little affected (Whelan 1995; Bond and van Wilgen 1996; Bradstock et al. 2002; Trabaud and Prodon 2002; Burrows and Wardell-Johnson 2003; Williams et al. 2003). Spatial scale is recognized as important when measuring and interpreting temporal and spatial turnover of species richness and assemblages. The scale at which species assemblages are measured, the scale and rate of dispersal, and the scale of processes, random or deterministic, that drive species turnover, are linked. (Greig-Smith 1952; Wiens 1989; Huston 1999; Whittaker et al. 2001; Penman et al. 2009). In the current study, we used a 10 m2 quadrat as the base measure for sampling species assemblages within plots or treatments and through time. However, quadrat-level occurrence was found to be a good predictor of plot level occurrence (semi-log relationship with R2 = 0.87). Without a firm understanding of the processes of recruitment, mortality, and dispersal, it is not possible to know the full spatial extent to which the findings of the current study apply, beyond the scale of quadrats and plots used. While we observed temporal drift in species assemblages at the plot scale at both sites, it is possible that this was an artifact of the sampling scale—at the whole-study-site scale (40 ha) or larger scale (regional)—such that drift may not be detected and species assemblages may be stable through time. The appropriate spatial scales at which to adequately measure and interpret the spatial and temporal turnover of species assemblages with respect to disturbances and environmental gradients remains a challenge for ecologists (Crawley and Harral 2001; Rhabek 2005; Chase 2014). Two sites representing moist and dry jarrah forests of southwest Western Australia were exposed to five fire treatments over almost 30 years, including very frequently burned and very infrequently burned treatments. From the beginning to the end of the study, the species assemblages within 10 m2 quadrats and 4 ha plots changed significantly. Surprisingly, fire treatment was not a significant factor. The pattern of species turnover was different between the sites; at the dry forest site, which had been fenced to exclude grazing, the changes occurred relatively early in the study, so may have been a grazing response. However, at the moist forest site, which was not excluded from grazing, the change in species assemblages was uniform over the period and across all fire treatments, suggesting ecological drift, which was largely driven by turnover of obligate-seeder shrub species. Species richness was also independent of fire treatment at both sites. However, there was an inverse relationship between species richness and time since fire at both sites, but only at the drier site could this be demonstrated as an effect of time since fire. Within-site, there were clear patterns of changing composition based on life form and fire response groups, but this was not consistent between sites. The findings of this long-term study reveal how resilient these fire-prone plant assemblages are to a range of fire regimes, including the current managed prescribed burn regime, and how different assemblages, fire response types, and species can have different trajectories through time. The study also highlights difficulties associated with designing, maintaining, and interpreting long-term fire ecology studies beyond the costs and logistics of doing so, including issues of scale, sampling intensity (spatial and temporal), plant detectability and identification issues, taxonomic revisions, and the difficulties of isolating effects of stochastic factors such as ecological drift, grazing, and climate variability on post-fire trajectories of vegetation. 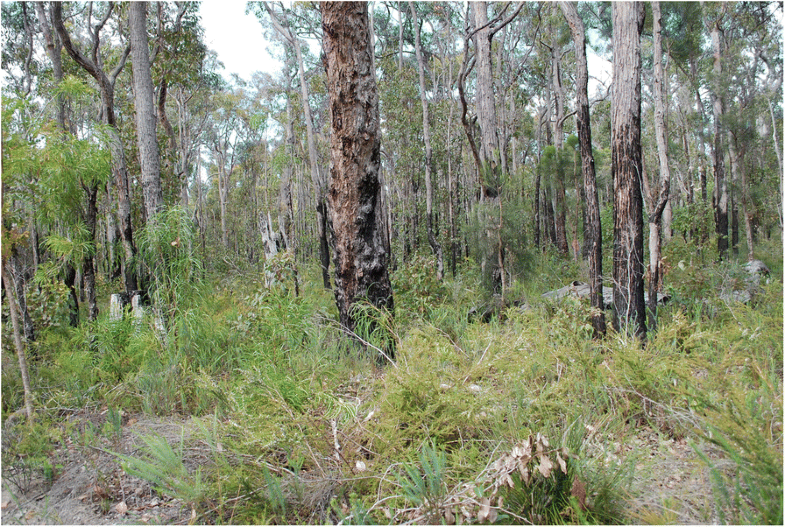 Contrasting changes in vegetation composition over elapsed time indicated that interactions between post-fire trajectories of assemblages and grazing by native fauna in Australian temperate forest ecosystems require further investigation. The absence of underlying fire treatment effects (from repetition of fires in spring or autumn) on understory assemblages and species richness means that prescribed burning demonstrably satisfied the precautionary principle in terms of effects on vegetation biodiversity. Within the fire frequency ranges investigated in this study, there is flexibility in frequency of application of prescribed fire to achieve fuel reduction goals to effectively protect communities and the environment from damaging wildfires. Contemporary and future rainfall and temperature trends associated with a changing climate have the potential to modify vegetation responses to fire and long-term changes in vegetation composition generally. Consistent with adaptive management, carefully designed and dedicated long-term studies (or monitoring sites) are required to discern these interactions and inform fire management practices. We thank the Western Australian Parks and Wildlife Service staff in the Blackwood and Donnelly districts who safely implemented the fire treatments; T. Annels (retired), A. Robinson (deceased), and J. Fielder for their invaluable field assistance; and V. Tunsell for managing the database. All funding was provided by the Western Australian Government. Data used in the current study are available from the corresponding author on reasonable request. N. Burrows designed and led the project and carried out some field work, B. Ward and R. Cranfield carried out field work, and A. Wills carried out analysis with assistance from M. Williams.